Rhys Webb staked his claim for an immediate recall to Wales duty as his introduction spurred the Ospreys to a comeback win over Munster in the Pro12. Webb, back after five months out, came on moments after Robin Copeland's 52nd-minute try had put Munster 17-10 ahead. The scrum-half's passing and darts got the Ospreys on the front foot as Owen Watkin's try put them ahead. Sam Davies notched 16 Ospreys points with Duncan Williams and Francis Saili scoring first-half Munster tries. Webb, 27, had not played since suffering the foot injury in September which ruled him out of the World Cup. But he showed no rustiness after his introduction for Brendon Leonard before having to go off himself a minute from time with an apparent cut. Leonard had been caught out for Munster's opening try in the 12th minute as his attempted clearance was charged down by opposite number Duncan Williams who ran in under the Ospreys post unopposed. After Keatley added the extras, Munster had an escape as youngster Darren Sweetnam produced a try-saving tackle to prevent a breakaway try after Tom Grabham had intercepted a pass by the home fly-half. The Ospreys did get on terms in the 25th minute as Davies finished off a period of intense pressure by stepping inside Munster flanker Jack O'Donoghue to score. 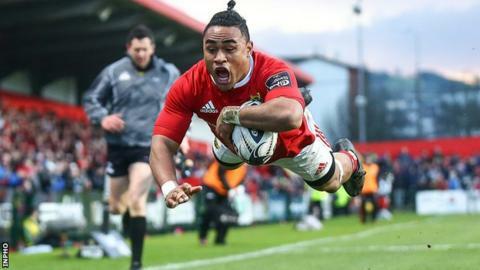 Saili restored Munster's advantage within three minutes as he produced searing pace to evade Dan Evans and Ben John before spectacularly leaping over the line. While Davies cut the margin to 12-10 before the break, the home side looked on course for a bonus-point win when Sweetnam's superb break and off-load set up Copeland to score. But then came Webb's introduction and after Davies cut the deficit to 17-13 in the 56th minute, the Ospreys were ahead four minutes later following a slick exchange of passes between Josh Matavesi, Rory Thornton, Davies and try-scorer Waktin. Davies added a further penalty as the Ospreys bossed the closing minutes to move to within three points of the sixth-placed Irish province in the table. Munster: Andrew Conway; Darren Sweetnam, Francis Saili, Rory Scannell, Ronan O'Mahony; Ian Keatley, Duncan Williams; Dave Kilcoyne, Mike Sherry, John Ryan; Dave Foley, Mark Chisholm; Billy Holland - capt, Jack O'Donoghue, Robin Copeland. Replacements: Niall Scannell for Sherry 53, Mario Sagario for Ryan 70, Shane Buckley for Chisholm 61, Tomás O'Leary for Williams 70. Not used: Peter McCabe, Conor Oliver, Cian Bohane, David Johnston. Replacements: Scott Otten for Parry 64, Gareth Thomas for Smith 52, Ma'afu Fia for Arhip 9, Adam Beard for Bernardo 70, Olly Cracknell for Bearman 52, Rhys Webb for Leonard 52, Owen Watkin for Matavesi 44, Tom Habberfield for Webb 79.